Stephen Barrett, M.D., a retired psychiatrist who lives near Chapel Hill, North Carolina, has achieved national renown as an author, editor , and consumer advocate. In addition to heading Quackwatch, he is a Fellow of the Committee for Skeptical Inquiry. In 1984, he received an FDA Commissioner's Special Citation Award for Public Service in fighting nutrition quackery. In 1986, he was awarded honorary membership in the American Dietetic Association. From 1987 through 1989, he taught health education at The Pennsylvania State University. He is listed in Marquis Who's Who in America and received the 2001 Distinguished Service to Health Education Award from the American Association for Health Education. He is also a board member of Prescription Justice, a nonprofit group that is working toward lower drug prices. His research library, pictured below, houses more than 5,000 books and 100,000 documents and recordings collected over a 50-year period. An expert in medical communications, Dr. Barrett operates 23 Web sites; co-edits Consumer Health Digest (a free weekly electronic newsletter); and has been a peer-review panelist for several top medical journals. He has written thousands of articles and delivered more than 300 talks at colleges, universities, medical schools, and professional meetings. 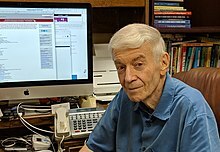 His 52 books include The Health Robbers: A Close Look at Quackery in America and eight editions of the college textbook Consumer Health: A Guide to Intelligent Decisions. One book he edited, Vitamins and Minerals: Help or Harm?, by Charles Marshall, Ph.D., won the American Medical Writers Association award for best book of 1983 for the general public and became a special publication of Consumer Reports Books. His other classics include Dubious Cancer Treatment, published by the Florida Division of the American Cancer Society; Health Schemes, Scams, and Frauds, published by Consumer Reports Books; The Vitamin Pushers: How the "Health Food" Industry Is Selling America a Bill of Goods, published by Prometheus Books; and Reader's Guide to "Alternative" Health Methods, published by the American Medical Association. From 2012 through 2016, he served as North American co-editor of the journal Focus on Alternative and Complementary Therapy (FACT). His media appearances have included Dateline, the Today Show, Good Morning America, ABC Prime Time, Donahue, CNN, National Public Radio, and more than 200 radio and television talk show interviews. Since moving to North Carolina in 2007, Dr. Barrett has been swimming competitively and has won 129 state championship events, 33 medals in national events, and 16 medals in international events and has set 13 state records. At the 2012 U.S. Masters Spring Nationals, he and three teammates earned Relay All-American Awards for the fastest times swum in the U.S. in 2012 in the age 75-79 men's 200 freestyle and 200 medley relay events. During the 2013 season, he won 3 three gold medals at the North Carolina Senior Games, 3 silver medals at the National Senior Games, and became a world champion by winning the age 80-84 men's 50-meter butterfly event at the Huntsman World Senior Games. In 2014, he won 2 gold, 1 silver, and 2 bronze medals at the U.S. Masters Summer National Championships and 5 gold and 1 silver medal at the North Carolina Senior Games. In 2016, he became certified as an instructor in the U.S. Masters Adult Learn-to-Swim program. When time permits, your questions related to consumer health will be answered by e-mail. The most interesting ones will be posted (without the sender's name) to this Web site. Before sending a question, please search Quackwatch to see whether the topic has been covered! If you prefer to phone, please send an email message first so I can retain your contact information. This page was revised on March 26, 2019.